Once we add mobile platform then we can run our application by using real mobile device or emulator. I have added IOS platform to myapp already. 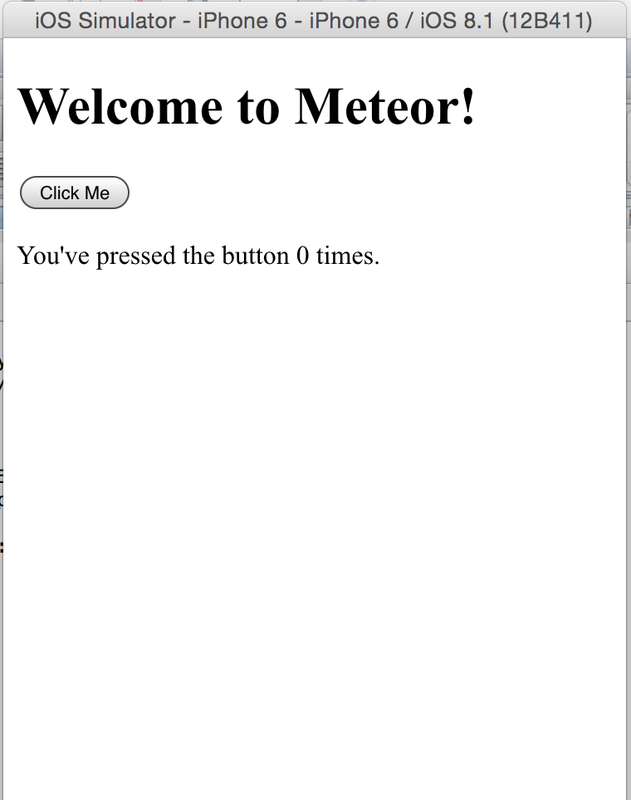 Now I am going to run that application by using iPhone emulator by invoking command called “meteor run ios”. Whenever we run above command that will add cordova support to the application and convert our web application into mobile hybrid application by using cordova. Cordova internally use webview for rendering web page. If everything is done, you can see iPhone simulator, that will display our web page. 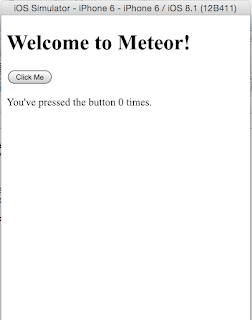 By using same way we can launch android simulator by invoking “meteor run android” command. We can run our application on real device by invoking below commands. Obviously the mobile should be connected to the computer. For iOS, we need to install corresponding provisioning profile into the device before using it for testing. Personally I like this approach because there is no real IDE like XCode, Eclipse involved in this process. This is really helpful for beginners because it is very simple and hides lot of internal mechanism involved in the process. 1. Adding mobile support to meteor application. 2. Running application on emulators. 4. Configuring mobile application metadata by using mobile-config.js. In my next tutorial, I am going to explain internal architecture of the meteor application. Good Gnana, thanks for the information. Keep writing. Waiting for the next part. This is really a great post. Thank you for taking time to provide us some of the useful and exclusive information with us. Keep on blogging! Good information and It will be really helpful for the mobile application developers!! The screenshots explain more to understand better!! Check our mobile application blogs also. We share it this article blog information is very effectively.We post this information is exclusive content.Keep it touch!!! Your Blog is really interesting to read..Thanks for sharing such a nice Blog..
Good post. keep sharing...CCNA Training Institute in Chennai | CCNA Training Institute in Velachery. great and nice post.. exciting information from your post..